Keeping a strategic planning session productive is hard. 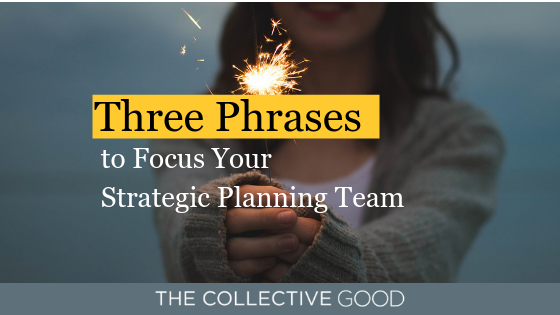 It takes patience, finesse, and good tools to refocus a strategic planning team to the task at hand. When emotions run high and time is of the essence, I’ve found success with these three concepts; try one at your next session. Nothing, in my line of work, is ever, ever in a vacuum. Not even outer space provides a perfect vacuum if I’m getting nit picky (and I am). The concept is so central to strategic planning that I’d classify it as a tenet (that it happens to sound cerebral is a plus too). Where vacuums are defined as areas of space which are devoid of matter, systems are defined as “wholes” with a variety of components. Systems exist at all levels of life, society, economies, businesses (and non-profits are businesses), etc; think the Earth’s water cycle, the circulatory system, the economy, a car, a circuit, etc. Raise the temperature of the oceans by a few degrees C? Stronger storms, more rain, higher salinity. Change one part, others may follow. Systems can be simple or complex, static or dynamic, adaptive or non-adaptive. Our team likes to think of organizations as complex adaptive systems, where understanding each part of the organization does not necessarily mean that one can predict all outcomes from any change. Changes made to individual business or program units can affect the entire organization. Even a small change in a theory of change could ripple across your organization. So next time you’re in a strategic planning meeting and the team begins to ignore the fact that changes made to one aspect of an organization may negatively (or positively!) impact another, remind them that nothing, not even space, is in a vacuum. We call this hitting the “Elmo Button” at our firm. Meetings can start to get off track quickly when opinions differ, this is especially true in strategy meetings. Passions tend to run high when discussing the future of an organization (a good thing which shows investment) but this can create long, drawn out discussions which don’t lead to a decision (a bad thing which slows progress). Using “E.L.M.O.” is a way to remind the team that there are certain objectives which need to be accomplished, and that we can still move the process forward without coming to a concrete decision on the point at hand. The one caveat is that sometimes, the meeting simply can’t move on if there is a critical path decision which needs to be made; it’s the role of the facilitator or the leader in the room to recognize this and push through. Anyone in a meeting should feel able to say “Enough! Let’s move on.” Thought be careful it’s not abused by someone trying to railroad through an important conversation. This is one of my favorite things to ask in a meeting. Instead of attacking a challenge directly, sometimes it’s best to approach it from an opposite perspective. Asking, “how do we make sure we never realize our vision?” or “how would be break this process to make sure it never worked?” can uncover fundamental characteristics of the challenge or problem your team is tackling.